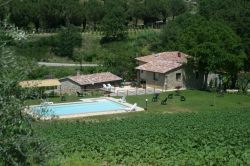 In the heart of Tuscany, surrounded by sunflowers and fruit trees, amid the wonderful valleys of Siena, lies this enchanting country home. 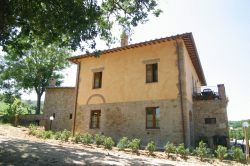 Right at the entrance of the village of S.Albino, close to the well-known Montepulciano spa establishment, this farmhouse has recently been restructured. The old millstone has been turned into a modern structure yet keeping alive the past customs and origins of the Tuscan farmers. 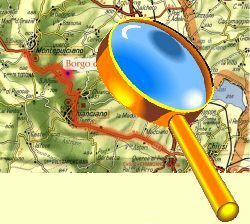 « Borgo del Molinello » offers you the opportunity to enjoy a very varied holiday. 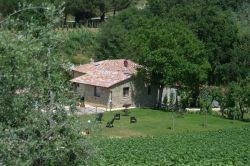 If you are interested in art, just go on cultural trips to very famous towns , such as the medieval Montepulciano (4 km away) and Pienza (15 km away), Chianciano, (3 km away), Bagno Vignoni (22 km away), Montalcino and Siena (35 km away). 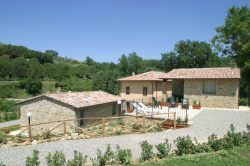 Florence, Perugia, Rome are also within easy reach (one hour by car). If you want to discover the beautiful countryside, you can rent mountain bikes here and go for unforgettable rides. Then you can relax in our nice swimming pool (6X12), equipped with comfortable deck-chairs and wonderfully lit at night. In the garden there is a gazebo and a barbecue where you can enjoy delightful dinners in the open air. There is also a room with a large table suitable for big parties, provided with a kitchen and a private toilet. There are laundry facilities and you have the chance to buy local farm products, some of which we ourselves produce.